If you're an author and have a few beta readers who help you test out your novel before it gets published OR if you're a blogger and would love to receive ARCs and beta books from authors for reviews, this is a great option! It takes just a little bit of time to set up, but once you've done it, not only is it a breeze to do again, you only have to do it once per author/sender. Once you've downloaded your app and registered it with your Amazon account, you can receive books via e-mail just like a regular Kindle device. Here's how! The file sent to the Kindle must be either a MOBI or PRC file. The file is e-mailed to the Kindle e-mail address and the book will then be automatically loaded onto the Kindle the next time it connects to Wi-fi/3G. Toward the top right of the Amazon.com home page, you should see a button/section that says “Hello, [your name or “sign in”] Your Account”. Hover your mouse over (don't click on) the Your Account button/section. It will probably ask you to login to your Amazon account – go ahead and do that and you will be forwarded to the Manage Your Content and Devices page. When you arrive at the Manage Your Content and Devices page, there are some tabs at the top. Click on the “Your Devices” tab. Your Kindle device and any devices that have the Kindle application (e.g., smartphone, iPad, computer, etc.) will be listed here with picture icons. Click on the device where you want to receive documents or eBooks. 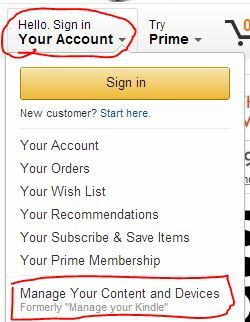 Clicking on the icon for the device of your choice should display, just below the icons, an e-mail address that ends in @kindle.com. THAT’S the e-mail address of that Kindle device/app. Put that information aside for now. If you did the above steps, you’ll already be at the “Manage Your Content and Devices” page. If not, please follow steps 1-4 above before proceeding to the next step. In the box that appears, type in @arialburnz.com (or your e-mail address or the e-mail address of the author/person sending the eBook). 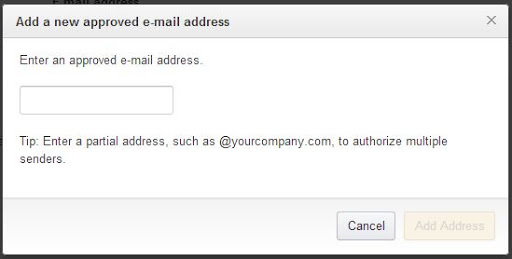 If you exclude the name prior to the “@” sign, you are approving to have anyone who has an email address from that domain name to send documents. This is great for those websites you trust (like your favorite author) because then their assistant, who might be at the same domain name (e.g., assistant@arialburnz.com), will also be able to send an eBook to your Kindle app or device. CAUTION: You DO NOT want to use public email domains like “@yahoo.com” or “@gmail.com” or you'll be approving EVERYONE who has one of those email addresses as an approved sender. Click the “Add Address” button. Be sure you follow all the steps above for both sets of instructions, or this won't work. If an author or friend is going to send the eBook to your Kindle, then you need to send them the e-mail address of your Kindl, which you grabbed and put aside back in Step 7 above. (Remember, they needed to be the e-mail address you added in Step 4 of “How to Approve an E-mail Address to Receive Documents” above. If you are sending the eBook to your Kindle (or an author is), then compose an e-mail addressed to the @kindle.com address for your Kindle. Attach the MOBI or PRC file of the eBook to the e-mail you're composing. Do not put anything in the body of the e-mail. It won't be seen by the Kindle anyway. The only thing that matters is the attachment(s). Yes, you can send more than one eBook file in the same e-mail. Click send and off it goes!! On the device/application, you must sync the device, so it must have a wireless connection. Once it's synced, you should find the eBook in the “Docs” section of your Kindle device or app. Sadly, you might not see the cover of the book, but you should see the name of the file. For those of you who have a Nook and aren't sure how to load a file onto your device, go to this link for detailed instructions: How To Transfer Files from Computer to Nook Tablet. Do this for your own device! 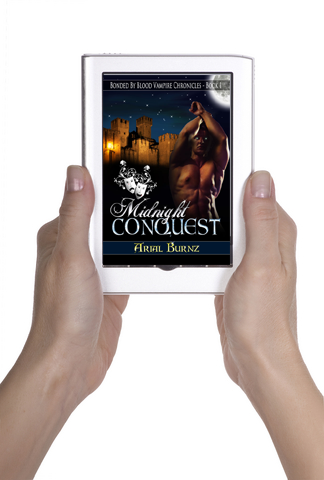 Just set your Kindle up as instructed above, then e-mail the eBook to your own Kindle. You'll not only see how the process works, but you'll get to test the book on your reader and see if you need to make any fine-tuned adjustments. Authors, in my next article, I'll show you how you convert your MS Word document into the various eBook file formats for any eReader! Niiiiiiiiice. I knew how to do the kindle thing, because I'm stubborn and stuck with it, but how to convert an MS word doc to other formats? No, on that I am a complete dunce. Can't wait to learn how. Thanks for sharing, Arial. You rock! I'm assuming you use the free Calibre program to convert file formats? Thanks, Arial. I have also learned recently how to put my own work onto my kindle after reading about it in a writing mag. It's learning little bits like this that just help make your life easier, isn't it? That's right, Nancy! I'm surprised to find out how many authors do NOT know about Calibre. I hope to introduce the eBook management software and perhaps a little tutorial. If the post is too long, I'll stretch it out over a couple of posts. I'm glad to hear you know about it!! Absolutely!!! Every little bit helps! 😉 Thanks so much for stopping by and commenting! Hi Arial. I knew how to send my MS to my own kindle devices but I hadn't thought about using it to send to beta readers kindles. Great idea. I'll be using it. 🙂 Thanks. I'm a new fan!! 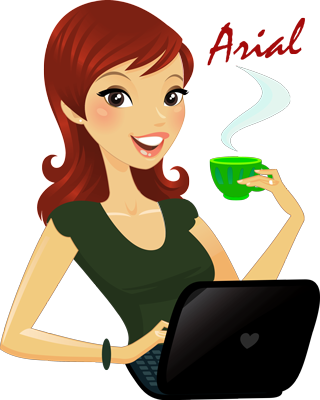 :)) Always looking for great new authors, happily signed up for your newsletter and added your email to my kindle a dress. Lol, I Never knew that I could that, thanks for the info!! I'd love to read anything you'd like to send and of course post a review!! :)) Thanks again!! Yep! It was a moderation thing. So sorry I didn't get to this sooner! I'm THRILLED you're a new fan! I saw you signed up for my VIP Club, so you'll be happy to know you'll be getting lots of fun reading materials. And Book 5 is almost here!!! I appreciate you also signing up for the review team! I'm looking forward to your reviews!